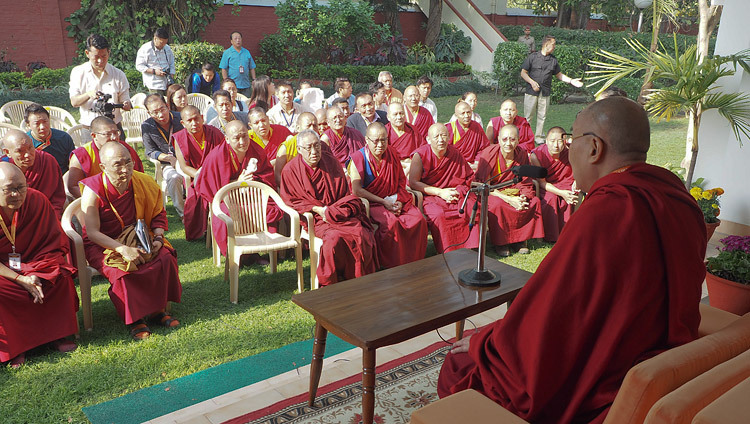 March 20, 2018, Sarnath, UP, India – Before attending the Association of Indian Universities’ (AIU) Meet this morning, His Holiness the Dalai Lama spoke to a gathering of Central Institute for Higher Tibetan Studies’ (CIHTS) teachers. He recalled that Kapila Vatsyayan had taken the initiative to establish the Institute fifty years ago to help keep Tibetan culture alive. He observed that as people have become aware of the shortcomings of modern education, interest has grown in ancient Indian traditions. The past extensive use of logic and reasoning is now only to be found preserved in the Tibetan tradition. In addition, Tibetans find themselves almost the sole repository of the ancient Indian understanding of the workings of the mind and emotions. “I have suggested that study of these things should not be confined to monks and nuns, but should be made available to lay people too. However, it is difficult to accommodate them in our monastic institutions. With the establishment of the Institute of Buddhist Dialectics and this institution it became easier for lay people and foreigners to engage with our traditions of study. Lay people could, for example, confine their attention to the Middle Way School, Perfection of Wisdom and Logic and Epistemology. The needn’t pay close heed to monastic discipline, which is only the concern of the ordained, or Higher Knowledge (Abhidharma) much of which, like its account of cosmology, is becoming difficult to defend. We could even offer subsidiary degrees in Middle Way, Perfection of Wisdom and Logic only. “The great classic texts are available in Tibetan, we don’t have to rely on Sanskrit or any other language to read and study them. And it’s worth remembering that being able to recite in Sanskrit isn’t nearly as important as being able to read and understand the meaning. Back in the Conference Hall, Prof PB Sharma welcomed one and all. He asked the Vice-Chancellors to consider how to identify values beyond religion, values that can be accepted as universal in that they apply to the whole of humanity. He quoted His Holiness as saying that karuna or compassion, truth and honesty are values that belong to us all. When His Holiness was invited to offer opening remarks he replied that he had nothing special to say other than that he enjoyed seeing the audiences’ smiling faces. He also made clear that he was looking forward to hearing other people’s views and suggestions. “One thing, however, that I’d like to tell you is that I always sleep nine hours and get up at around 3am. Then I spend about three hours in meditation, mostly analysing the nature of self and investigating where is the ‘I’. “Yesterday I didn’t mention that scientists have found evidence from experiments with infants before they are able to talk that suggests that basic human nature is compassionate. At the same time they have evidence that constant anger, hatred and fear hamper our immune system and undermine our health. Warm-heartedness, on the other hand, supports it, which I take as a real sign of hope. I’ve also seen Palestinian and Jewish children happily playing together in a Pestalozzi school in Switzerland, without hesitation or restraint. Geshe Lobsang Tenzin Negi of the Center for Compassion, Integrity and Secular Ethics gave an intense summary of the Value and Necessity of Secular Ethics in Education. He repeated His Holiness’s observation that while providing external comfort and development, modern education has neglected inner development. He cited the World Happiness Report’s account of the importance of mental health in adults, in childhood, in parents and in the social ambience of primary and secondary schools. Key to the Cognitively-Based Compassion Training (CBCT) Negi has pioneered is a sense of emotional intelligence, which owes much to Paul Ekman’s work towards an atlas of emotions and what has been gleaned from ancient Indian sources. He suggested these skills should be part of the school and education system. Prof Deepak Behra of Sambalpur University proposed taking a more anthropological perspective on the question of education. He spoke of leading educationists shaping young minds and, perhaps inadvertently, inculcating them with competitive and self-centred attitudes. He observed that to be successful young people seek to secure skills, but when they have done so, finding themselves unemployed leads to anger and frustration. During a short period of interaction with the Vice-Chancellors His Holiness clarified that by emotional hygiene he means tackling negative emotions as they arise before they run out of control. Asked his views of gender disparity he cited the Buddha’s regarding men and women equally inasmuch as he gave ordination to both. He compared persisting gender disparity to caste discrimination which is a remnant of feudalism that remains after the feudal system has gone. Today, he said, we live in a democratic world of equal rights. He emphasized that we need to work to develop compassion, but that it can be done on the basis of scientific findings. He also clarified that the nature of action depends on the motivation. For an action to be positive or constructive, the motivation for it needs to be positive, driven by a concern for others, too. He suggested we have to make an effort to reinvigorate our basic human nature. Answering a final question about ‘Buddham saranam gacchami’, His Holiness explained that from one angle the word Buddha implies the elimination of all negative qualities. Since it is the nature of the mind to know, so long as the mind is shrouded in ignorance, our ability to know is limited. Once it is freed of ignorance, destructive emotions have no sway and there is no constraint on the mind’s ability to know—another aspect of Buddha. Prof PB Sharma thanked the audience for their forbearance as the meeting ran out of time and thanked His Holiness once more for coming and gracing the occasion. His Holiness ate a quick lunch, drove to Lal Bahadur Shastri International Airport and boarded a flight for Delhi. Tomorrow, early in the morning, he will return to Dharamsala.